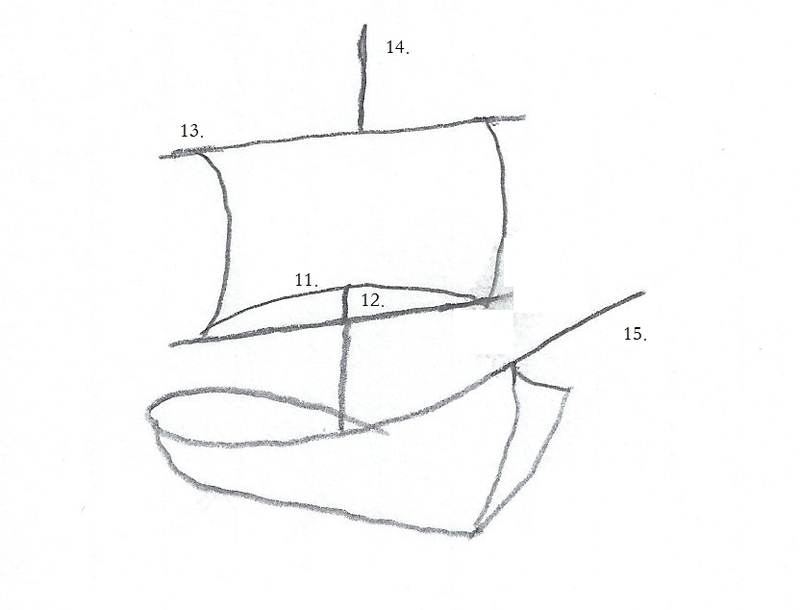 As I promised here is how John Alexander taught me (when I was not much older than Elizabeth) to draw a sailing ship. There are fifteen steps, and your first ship will take a little longer to draw than thirty seconds. 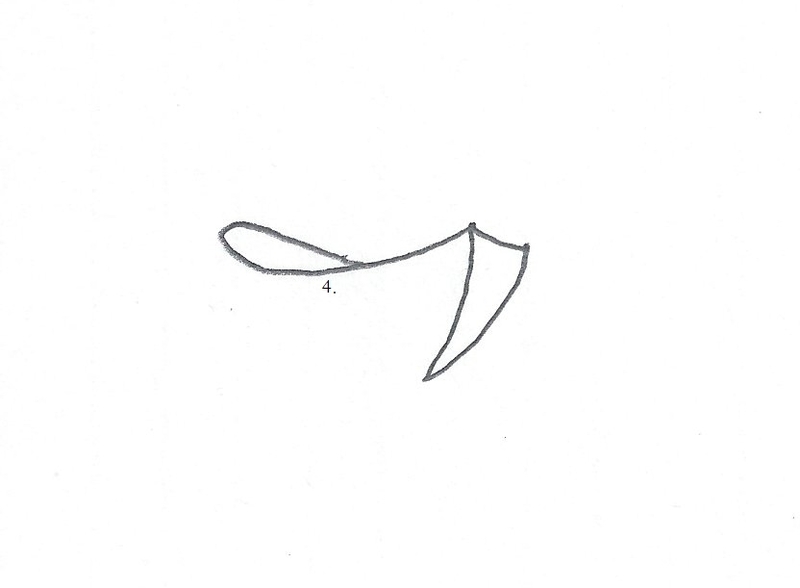 But, after you draw a couple, you will probably be able to draw several ships in thirty seconds. First, let’s see where we are going. 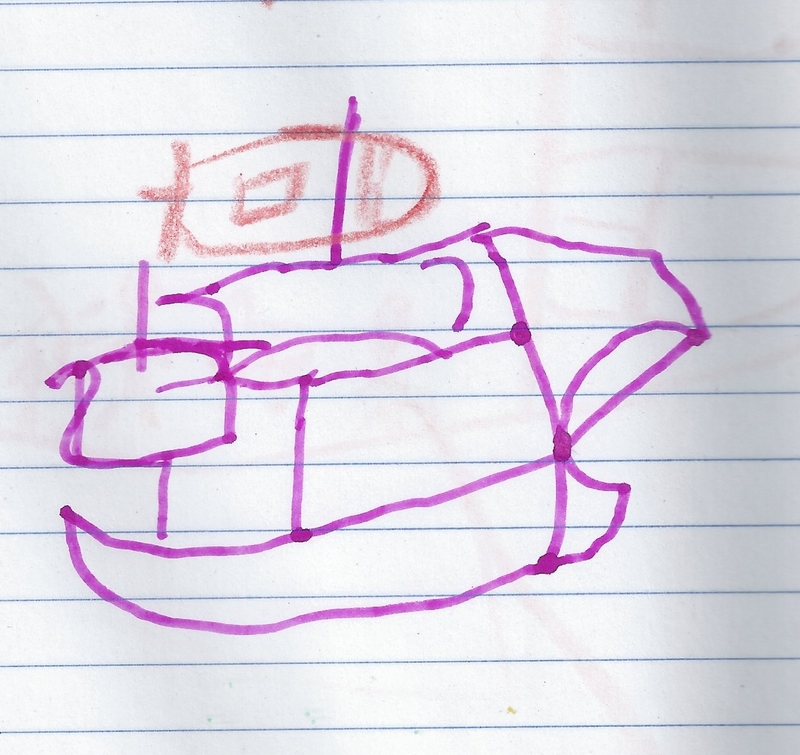 Above is Elizabeth’s first drawing of a sailing ship. Your sailing ship will look similar to her’s. Now that we know where we are going, we can start. Each step is numbered in the drawing, draw them in order and you will be fine. 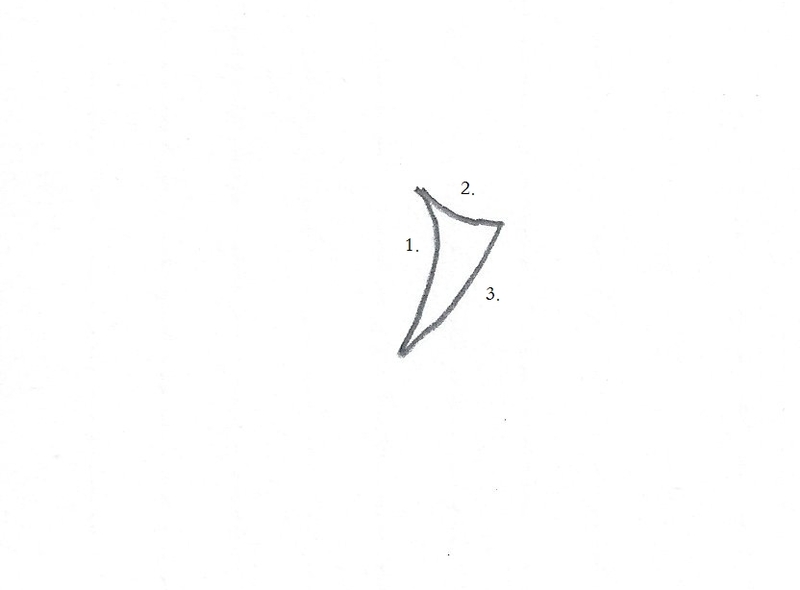 Step 1, we are going to draw the bow. The bow is the front of the ship and points in the direction the ship is going. Steps 2 & 3 are the left (port) side of the ship. In the drawing you can just see a little of the port side of the ship. Step 4 looks complicated, but it is not. It may be easier for you turn your sheet of paper sideways and draw a flat letter “P”. The line is the top of the starboard (right) side of the ship. The inside of the loop is the deck at the stern (back) of the ship. You are giving your sailors a firm place to plant their feet. 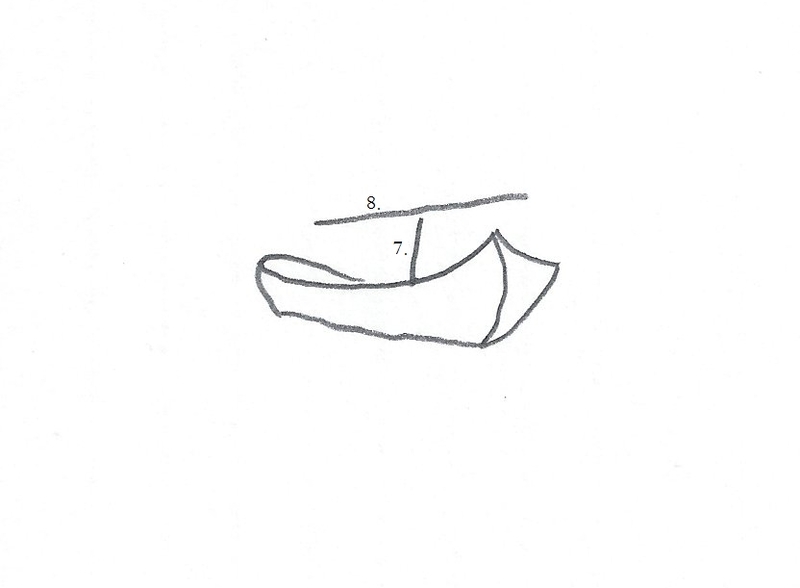 Step 5 is the stern (back) of the ship and step 6 is the rest of the starboard (right) side of the ship. Your sailing ship is now starting to look like a ship. You have given your ship its form. Now you need to get your ship moving. Wind moves sailing ships, and sails harness that wind. Your ship needs sails. But, before you draw your sails for power, you need a strong foundation to support those sails. 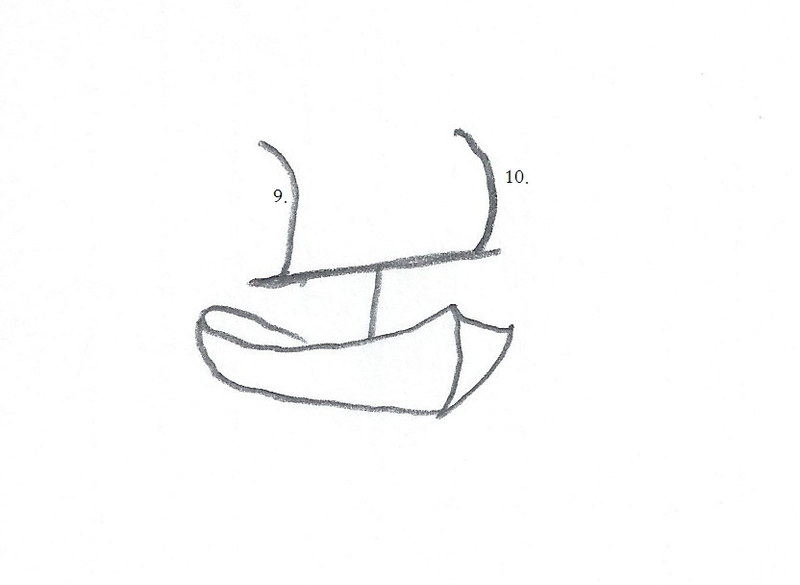 Step 7 is part of the mast. Some masts on some ships go more than 150 feet into the air. The mast supports the sails and the yardarms. Step 8 is a yardarm. The yardarm is the cross-piece that spreads the sails, it also supports the sails and keeps them in place. You now have the foundation and support to control your power. Steps 9 and 10 define the sails. They are curved because of the wind, your ship is moving. But, most people do not know the wind can pull a ship as well as push a ship. When the wind is coming from behind a ship, it pushes on the back of the sails and moves the ship forward. However, if that were the only way to move a sailing ship, ships would have a hard time getting to their destination. Sometimes the wind is blowing against the ship. So what do you do? You steer a course a little to the left or right of the wind. As the wind passes the front of the sail, it creates a low pressure area in front of the sail, like the top of an airplane wing. This low-pressure area pulls the ship forward. Now you can steer your ship to any destination you want. 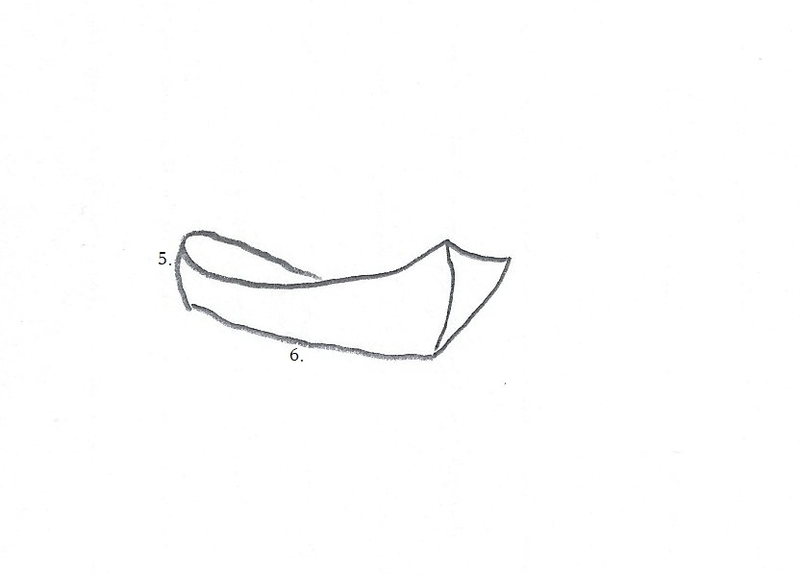 Step 11 is the bottom of the sail curved by the force of the wind. Steps 12 and 14 are the rest of your mast. Step 13 is the yardarm where the top of your sail is attached to the mast. Step 15 is the bow sprint. On great lakes ships it is not called a bow sprint, it is called a steering pole. There you have it, your sailing ship. A refresher before you go. First, you get an image of where you want to go. Then, you decide your direction. Next, you need a firm foundation to plant your feet on. Then, you create the form of your project. 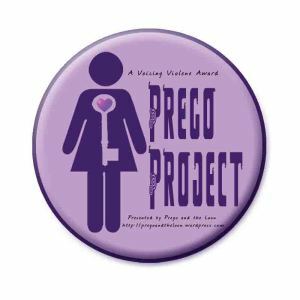 Now, you need to power your project, and to control that power. Sometimes forces work against you, but do not despair, adjust your course and steer toward your destination. You will prevail. You see? You have been drawing ships your whole life. Now you can do it with paper and pencil too. Now go out a teach someone else how to draw a sailing ship. Let’s see just how many more people can learn from John Alexander. A new tab on my page for all the personal and odd-ball articles that don’t quite fit someplace else. At the top Sunday’s article “The Great and the Insignificant” the quick link will not work until midnight on Saturday when the article is published. Actually I should have called it every father’s wish. But I shy away from people who speak for people. That said … I think you dads out there will agree with me. I hope you had a great Father’s Day last week, I did. Elizabeth’s first catch on a lure. Father’s Day 2012, Slate Run Park. Father’s Day 2012 was a warm, sunny day in central Ohio. We started our fishing trip by going out for lunch. As we drove the 45 minutes to Slate Run Park, we talked about the past week, and the many items pressing on the mind of a seven year old girl. I was amazed, Elizabeth is only seven years old, but I caught a glimpse into how she thinks. I saw how, as a woman, Elizabeth with solve problems and rationalize. 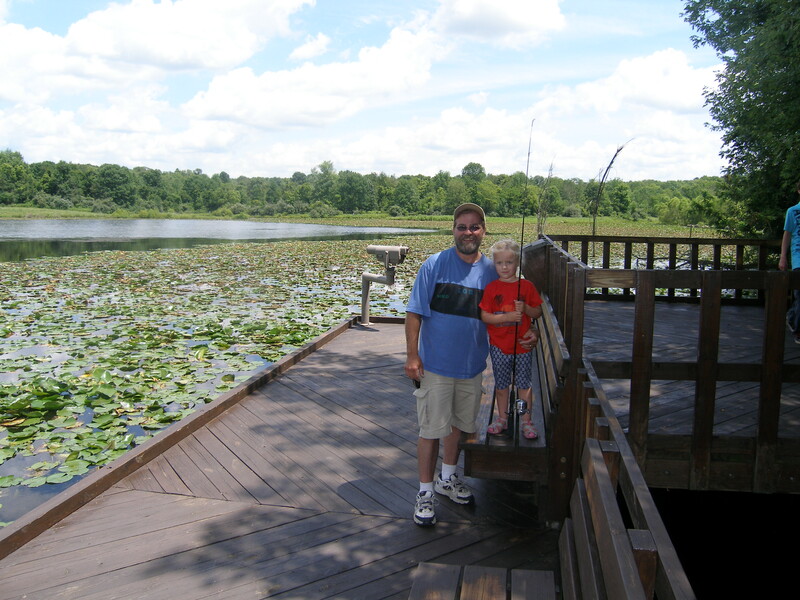 After solving the problems of the world, we arrived at the park and made our way to the second dock at the fishing pond. The first dock was full of people, and the second dock had a grandfather with his grandson using live bait. We were going to use lures. 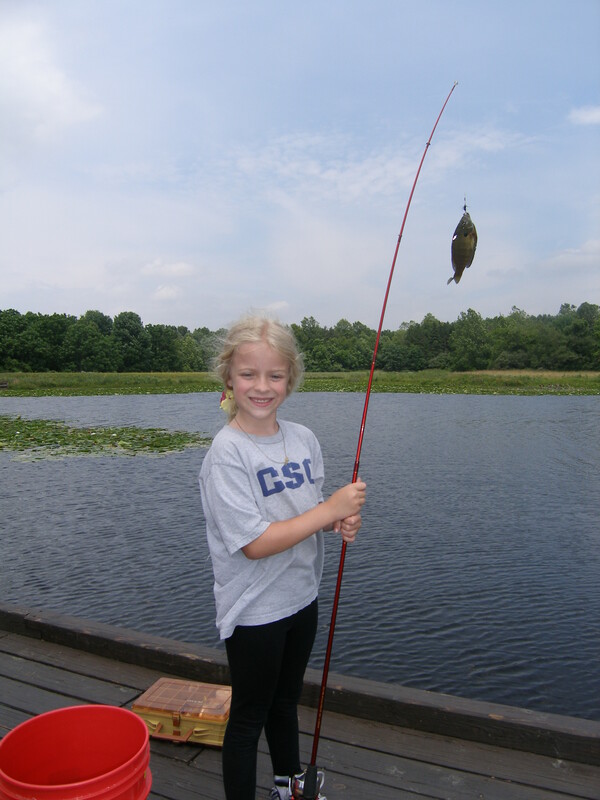 Elizabeth has gotten good at casting and I was looking forward to seeing her catch her first fish on a lure. 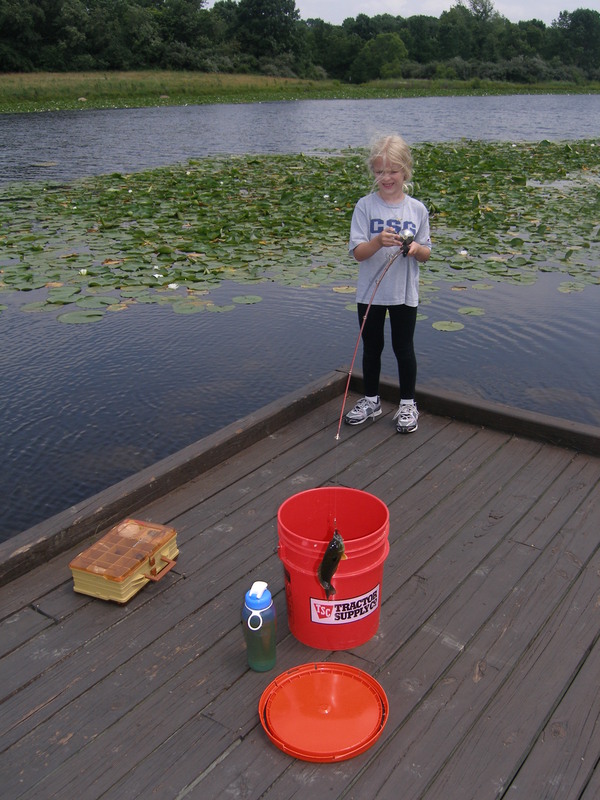 I tell her where to put the lure, and she calculates the wind and places the lure just right. All she needs from dad is where to cast too and she does the rest in her head, while we are talking about Barbie dolls and puppy dogs. Today though, the wind was high, moving from our left to our right, and the water choppy. Even the live bait fishermen were having no luck. I changed Elizabeth’s lure a few times, when she spotted my fly-fishing lures. Fly-fishing is a different style of fishing. Sport fishing is the most popular form of recreational fishing, the easiest, and most economical (though some people spend quite a bit of money on their sport fishing equipment). Fly-fishing is difficult and requires specialized equipment and techniques. Fly-fishing is art. Elizabeth’s, Father’s Day 2012, Slate Run Park. Elizabeth wanted to try the fly. Well, it was too choppy to catch anything. If she has a good time that is what counts. I tied the fly on her line. The laugh was on us. I pulled about seven feet of line out and handed my Shakespeare rod and reel to Elizabeth. Standing looking at the water for a few minutes, she held the pole out in one hand and the line in the other. Then, letting the wind take the lure, she dropped the bait on the surface. 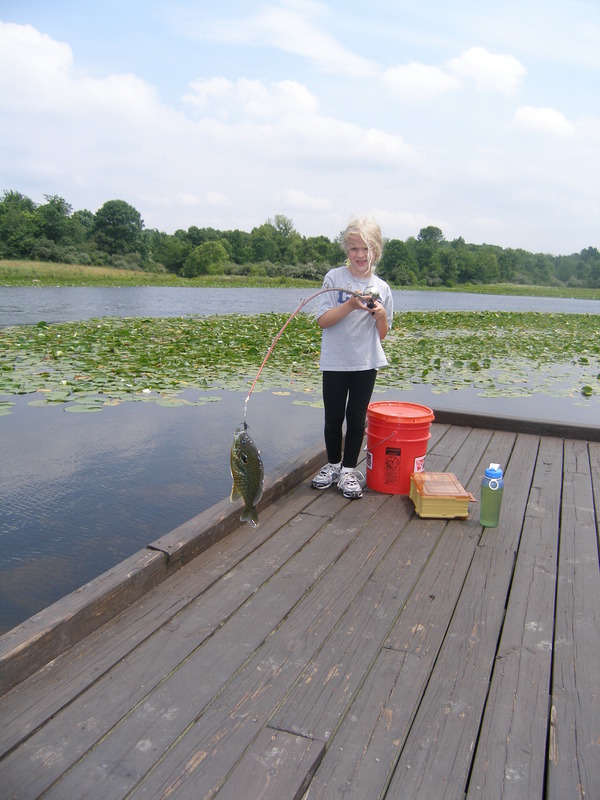 In three attempts she had three Bluegill, two eight inch and one seven inch. “I’ve never seen it either,” I said. We then left for the playground and a few hours on the swings and monkey bars. I loved the pictures and fishing pole Elizabeth made for me, but today I received the best Father’s Day gift of all. No, not the compliments my daughter received, though I did like that. The gift I received was more precious than a mere compliment. Every father wishes for his children to be better than he was. Alexandra had more courage and strength than I ever did. Elizabeth has the wisdom and empathy. Not the wisdom we usually think of, a wisdom of knowledge. Elizabeth has a wisdom of seeing and understanding. Elizabeth can see where the lure lands and understand where she needs to aim to get the lure where she wants it. She does this time and time again. More important, she does this in other things as well, not just while she is fishing. Elizabeth can see the things that are not and ask why. Quite often, she also understands how to make those things a reality, or at least she is trying to work out the problem in her mind. Empathy with foresight. Too bad more of our political leaders do not have this kind of empathy. Yes, I can say that my children are better than I am. No one knows how much time we have left. But, when my time comes I will be at peace in the knowledge that no matter what life may bring, Elizabeth will surpass her father. Is there a better gift a father can receive on Father’s Day? 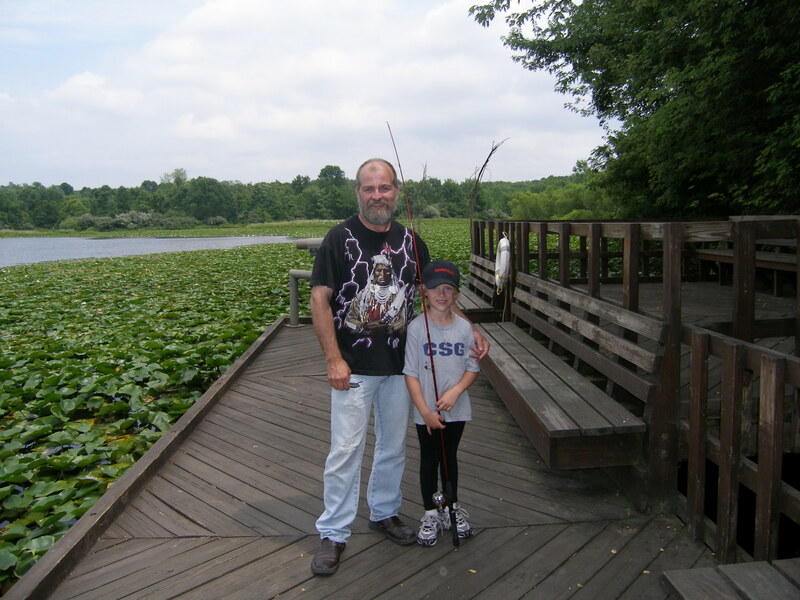 Elizabeth’s first fishing trip, Father’s Day 2009, Slate Run Park.